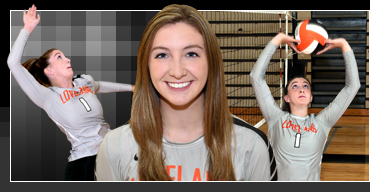 Loveland senior volleyball all-star Marie Plitt is a four-year varsity starter at middle blocker and outside hitter for the Lady Tigers. Entering this season, she has recorded 852 kills, 630 digs, 186 blocks and 84 service aces. Her 852 kills is already a school record for career kills. Her junior year, Loveland was an undefeated 14-0 in the ECC and was crowned conference champs. The team was 21-3 over all. Fighting some injuries her junior year, in 63 games, Marie had 252 kills, 186 digs, 39 blocks and 15 service aces. She was ECC Player of the Year, 1st team ECC for the third time, 1st team all-city (Enquirer), 1st team all-SWO District and honorable mention all-state. Sports at Loveland are a family affair for the Plitts. Mom Julie is the girls' volleyball coach, dad Steve is the Tigers' new baseball coach, brother Bryce played three sports for the Tigers and baseball for Xavier University and brother Drew was QB for the 2013 Ohio Div. II football champions and now is playing at Ball State university, where Marie will play volleyball next year. A good student who is active in community service, Marie also played basketball for the Lady Tigers. Her favorite athlete and most-like-to-meet is Michael Jordan, favorite entertainer is Beyonce, and favorite book is The Great Gatsby. Her club team is Elevation volleyball club. COACH'S QUOTE – "Marie exemplifies competitiveness and hard work. She is an outstanding teammate and leader who wants what is best for the team. Her energy and enthusiasm are contagious."